Highlights: This unique Lassen Tours itinerary blends the arguably the two most distinct symbols of America - Mt. Rushmore and Yellowstone National Park. The sheer size of the mountain carving on Mount Rushmore evokes a sense of awe in those who view it. We are also amazed when we see ourselves in the faces of the presidents. The four presidents carved in stone represent all Americans. They represent our courage, dreams, freedom and greatness. Each president possessed great skills and leadership of the brand our nation needed for the times they represent. We all can look into their faces and gain inspiration and strength from these four great men and ourselves. Visit the California State Capital – Sacramento. Founded in 1849, Sacramento was at the heart of the gold rush, Pony Express and first continental railroad. In the afternoon head through the famous Donner Pass and enter Nevada – nicknamed the Silver State. Overnight stay in Elko. Through the Great Salt Desert in the morning, the saline lake covers an area of around 1,700 square miles, but is subject to substantial fluctuations. Along the Emigration Canyon into Echo Canyon, visit the once traveled Oregon Trail. The trail represents the only corridor to the West. 1843 was known as “The great migration” and over the next 25 years more than a half million people went west on the Trail. The highlights of the trail also includes: the historical landmarks of Independence Rock, Devil’s Gate. Overnight stay in Casper. Mount Rushmore National Memorial, in South Dakota, is a monumental granite sculpture by Gutzon Borglum, located within the United States Presidential Memorial that represents the first 150 years of the history of the United States of America with 60-foot (18 m) sculptures of the heads of former United States presidents : George Washington , Thomas Jefferson, Theodore Roosevelt and Abraham Lincoln. Continue to Devil’s Tower National Monument. ‘Bear Lodge’ was the Native American name for the Tower. This 865 foot column- a remnant of a volcanic eruption was renamed in 1875 by a scientific team escorted by Col. Richard I. Dodge. Overnight stay in Gillette. Visit Yellowstone National Park, the first and oldest National Park in the United States. Highlights include: Yellowstone Canyon, Yellowstone Falls, Mud Volcano, Mammoth Hot Springs. There are also various wildlife that inhabits the Park from bison, elk, moose, and bear. Over night stay in West Yellowstone. 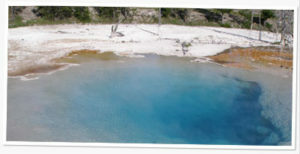 Continue visit Yellowstone National Park: the Old Faithful Geyser, Rainbow Pool. Continue to Grand Teton National Park. The tallest peak rises to 13,770 feet. Twelve of the peaks in Teton reach above 12,000 feet and support a dozen mountain glaciers. In the afternoon visit the state of Wyoming and visit the western town of Jackson Hole. Arches made of elk antlers decorate the central plaza in this town with plenty of shops and restaurants around the area. Over night stay in Salt Lake City. Visit Utah State Capitol Building and Temple Square. Arrive in Reno, Nevada in the afternoon, the city known as “The Biggest Little City in the World”, is the birthplace of the gaming corporation Harrah’s Entertainment. Overnight stay in Reno. Depart Reno in the morning and visit Lake Tahoe. As one of the deepest lakes in the United States, this freshwater lake is located between Nevada and California with two-thirds of its border in California. Perhaps join an optional cruise to visit this extraordinary lake. Head back to the Bay Area in the afternoon.